IDW is set to introduce readers to five brand-new original tales each week of the month this August! The Creator Visions event is a showcase of new series alongside the return of some fan-favorite titles that celebrate a breadth of unique and diverse comics. 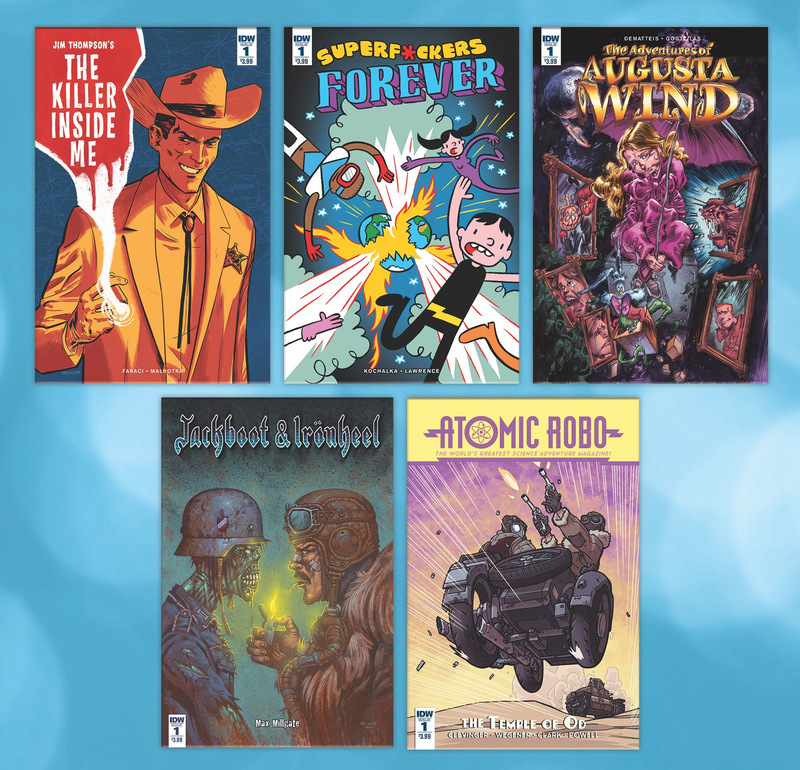 From the all-ages, action-packed adventures of Atomic Robo to an adaptation of a classic work of haunting literature, August has exceptional new material for every fan! Kicking off the weekly event is the return of the fantasy epic, The Adventures of Augusta Wind by creators J.M. DeMatteis and Vassilis Gogtzilas. This new 5-issue series, The Adventures of Augusta Wind: The Last Story, will conclude the magical tale that began in 2012, filled with weird worlds, bizarre creatures, and terrible dangers! Week two welcomes the return of the explosively fun series, Atomic Robo! This time around, take a trip back to 1938 with Robo as he investigates a deadly weapon alongside some unlikely allies in the five-issue Atomic Robo and The Temple of Od. Jackboot & Ironheel arrives in the third week from 2000 AD’s Sinister Dexter co-creator and longtime Judge Dredd artist Max Millgate, following the grim turn of events for an English football star turned R.A.F. tail-gunner in the heat of World War II! The charmingly profane and hilarious Superf*ckers, stars of a beloved Top Shelf graphic novel and corresponding YouTube series, make their monthly comic book debut from IDW in Superf*ckers Forever! Creator James Kochalka is bringing along some friends for this series with alternate covers and backups by some of indie comics’ biggest talents. August’s issue 1 sees a variant cover from Invincible artist Ryan Ottley and a back-up tale from cartoonist Jake Lawrence. IDW’s long history to creator-driven material goes back to its first monthly comic book 30 Days of Night, and has since grown to produce award-winning titles like Locke & Key, and Little Nemo: Return to Slumberland. That tradition remains a strong foundation at IDW with newer classics like Wild Blue Yonder, The Infinite Loop, and D4VE.